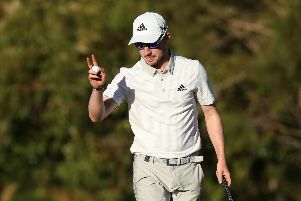 Russell Knox is slipping out of the picture as a Ryder Cup wildcard contender after losing more ground in the third round of the Dell Technologies Championship in Massachussets. Admitting himself that he needed a win in the second FedEx Cup Play-Off Series event to secure one of the four picks available to European captain Thomas Bjorn, the Scot got off to an encouraging start with a five-under- 66. That left him sitting joint-second but, after subsequent rounds of 72 and 71, Knox is now in joint-33rd heading into today’s final round at TPC Boston. The Invernesian had put himself on Bjorn’s radar earlier in the year after following up a second-place finish in the French Open at Le Golf National, where the Ryder Cup is being played later this month, by winning the Irish Open. But his hopes of securing a pick on Wednesday now look slim, especially with Henrik Stenson, Ian Poulter, Paul Casey, Sergio Garcia, Rafa Cabrera Bello, Thomas Pieters and now, of course, Matt Wallace all in the mix. Also needing a strong display, 2017 Scottish Open champion Cabrera Bello is sitting joint-12th in Boston while Casey shares 28th spot after both carded third-round 69s. Mexico’s Abraham Ancer takes a one-shot lead into the final circuit after he opened with three straight birdies, stormed to the turn in 30 and went on to card a 65 for a 13-under-par 200 total. His closest challengers are Tyrrell Hatton, one of Europe’s eight automatic qualifiers for the Ryder Cup, and Bryson DeChambeau, who is a certainly to secure one of Jim Furyk’s four picks for the US team. Hatton birdied the last for a 69 to sit on 12-under, joining DeChambeau, who is coming off a four-shot victory in the first FedEx Cup Play-Off event, after he carded a 63 in the company of Tiger Woods. Justin Rose (70) is also still in the hunt on 11-under, sitting alongside Australian Cameron Smith, while Rory McIlroy and Jordan Spieth are both on nine-under rounds of 66 and 68 respectively. Woods had to settle for a 69 that left him in a tie for 16th, six shots behind. Elsewhere, England’s Georgia Hall missed out on a second LPGA Tour triumph in quick succession as victory went instead to American Alex Marina in the Cambia Portland Classic. Hall, winner of the Ricoh Women’s British Open at Royal Lytham last month, led by two shots going into the final round but never really recovered from an opening bogey. She managed just one birdie in a closing 75, finishing runner-up, four shots behind Marina as she signed off with a superb 65 for a 19-under-par total to claim her breakthrough win on the circuit at the 124th attempt. LPGA Tour rookie Gemma Dryburgh finished joint-21st - her best effort of the season - on four-under, two shots ahead of Scottish No 1 Catriona Matthew in joint-35th.